Let me begin this entry by clearly stating that this gorgeous corset is the work of Crimson Rose Corsetry Couture, made in 2016. Now, let's move on to admiring this work of wearable art. The "Leviathan" corset is one that allow for remarkable flexibility, thanks to the sports mesh that makes up the four side panels. Further consider the clever patterning that comfortably contours a sway back, and it's clear that this corset can handle a good amount of movement. This corset was hand-crafted, from measurements to final product by the creator behind Crimson Rose Corsetry Couture. That includes the remarkable hand-painted scale patterns at the front and back panels. Brought into being in 2016, this corset's design was originally commissioned with just a few parameters in place. Sports mesh and no 3D embellishments, to make this corset conducive to being worn as an cool and functional undergarment. Colors (if at all) be confined to purple and teal. Hand-painting elements, as I had at that time just witnessed some of the creator's painting on their own personal corset - I was enamored! And, of course, the corset needed to fit my measurements (perhaps a silly thing to mention, but I want to emphasize that this corset was entirely custom). My preference was that this corset's design be left mostly to the maker, with just this vague outline coming from me. I certainly was not disappointed when I received my corset! This corset features 6 panels on each side, with external boning channels, and steel boning. Front and back panels are made of black canvas that have been hand-painted to replicate iridescent teal and purple scales. Purple cotton bias binding completes the top and bottom edges. Mesh layers on the sides are a combination of sports mesh and a sparkly stretch mesh. The black busk at the front closure is 12" in length, and the back is laced with color-coordinated double-sided satin ribbon. Comfort! The sports mesh and amazing patterning give me ample room for both my ribcage and pelvis, in such a way that this corset only places a small amount of pressure around my waist, while still delivering a fantastic silhouette. Wow, that hip shelf... Building off of the above point, the materials and patterning provide a remarkable contour that swoops over top of my iliac crest. As dramatic as it looks, this corset places almost no pressure on my hips. You can even see in the third panel of the corset how it's made to do this very thing. Aesthetically, this corset is very much "me". While I tend to be a bit hesitant to incorporate color of any sort into my wardrobe, my custom corsetry collection seems to feature many jewel tones, and this is no exception. I do love to add a mythic element to my personal style, and this corset fits perfectly into that preference. The stiffness of the front panel is perfect. While a flexible front closure is rather useful in certain contexts (if paired with a properly placed waist tape), I generally like the rigidity of a heavy-duty busk like this. It does a wonderful job of keeping the side-viewed figure looking just as sleek as it does from the front or back. I'm in love with the floating modesty panel. The way that it's made and suspended within the laces makes it very easy to manage and incredibly cohesive in terms of overall look, as it's made with a matching cotton. I must also emphasize that this modesty panel is stiffened and will not under any circumstances buckle or bunch up. This is everything you've ever wanted for a modesty panel! A shorter front length. The length of the front, from top to bottom, was entirely my error in terms of taking measurements, but this corset does sit a bit too long from underbust to lap for my comfort. Unfortunately, that's been a major reason as to why I have not worn this corset more regularly. I find that the bias binding does not match the stretch of the mesh quite perfectly, leading to a bit of a visual pinch point at the top and bottom of the corset. While there is absolutely no issue with comfort here, it does make the corset a bit more difficult to "stealth" - that is, to wear underneath of clothing without the corset's outline being noticeable. The waist size came out a bit differently than I expected, so I am looking forward to re-addressing that aspect. In the images included in this post, the corset is entirely closed. Externally, it measures 24" at the waist. For comparison, my original request was for a corset with a waist of 20". Having worn corsets for 7+ years, I am aware that 1-2" can be lost simply in the bulk of the fabric, such that the inner waist measurement is smaller than what is observed on the outside of the garment. However, I suspect that the waist tape might have been a bit stretchier than anticipated, or that the sports mesh caused more strain to be placed on that waist tape than would be with an all-coutil corset. 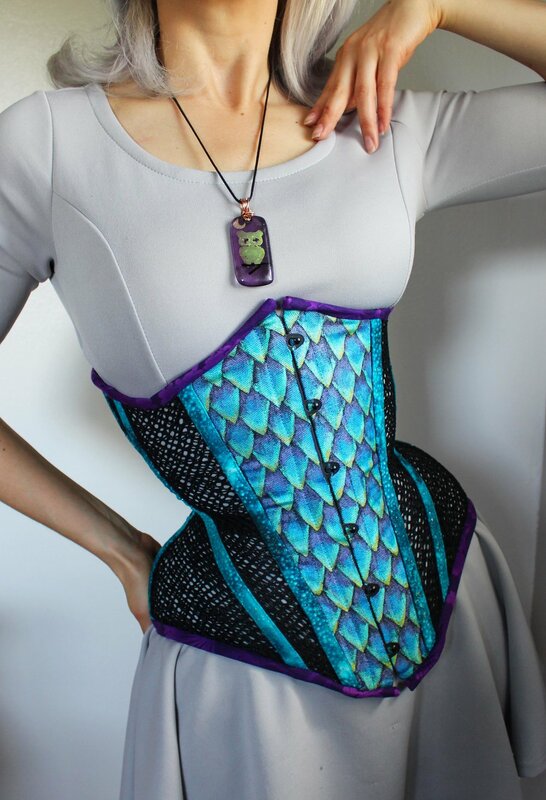 Regardless, this concern is one that I've been lucky enough to see the maker address in their work since this corset was created (again, this was made two years ago). Corset making is an art which I've been privileged to delve into, and my respect for the creators who bring these garments into being is beyond words. While I love being able to construct corsets myself, it is when I have the opportunity to bring home a new beauty from a professional maker that I feel most connected to this craft.